But for me the greatest thrill was my introduction to caddisfly cases. Now, I love nature deeply, but I am not particularly knowledgeable in the natural sciences. Kathy, however, is full of fascinating information about many of the plants and animals we meet on our hikes. Kathy suggested we stop at a little stream that crossed the trail and see what we could see. We knelt, lifted out a large rock, and turned it over. Clinging to the underside was a tiny caddisfly larva case. But only by looking through the magnifying glasses we had brought could we really see the tiny wonder in front of us. The case attached to the rock was astonishingly colorful. It was made of the tiniest pebbles of red, white, black, and brown, all firmly held into a tiny cigar shape by silk the caddisfly larva had spun around itself and the bits of rock. Cleverly, the caddisfly larva protects itself during the fall, winter, and spring it spends in the water by creating its own hard case. And as the larva grows during these months, it enlarges its case with more debris and silk. When it is time to pupate, the caddisfly attaches both ends of its case to an object in the water, such as a rock. Thus, the pupating animal is protected against predators, and water can still flow through the case. When the mature caddisfly is ready to emerge, it uses its special pair of mandibles to cut its way out of the case. Adult caddisflies seem to live to mate. They do not eat at all. After a week or two, or maybe longer, they die. The entire lifespan of a caddisfly is complete in a single year. resist; they touch; they flutter. a knife or a hammer, subsides. falls with its spills of pearl. the leaves of the world unfurl. Now that important health care legislation has finally been passed, Congress is moving on to an even more urgent goal: addressing climate change. The U.S. Senate is in the process of drafting climate and clean energy legislation, and Senate supporters hope to pass a strong bill this year. But if the debate over health care is any indication, we can expect a bruising fight over whether to require significant reductions in greenhouse gas emissions. Big oil, big coal, and other giant corporate polluters will stop at nothing to protect the status quo–i.e. big profits. With the most skilled lobbyists money can buy, along with their climate change denying friends in Congress, these powerful interests will do everything they can to block climate change legislation, at the expense of the planet’s–and humanity’s–future. But despite intense and well-financed opposition, we won a historic victory on health care. We can do it again on climate change. And we must. There is no way to effectively address global warming without strong leadership from the top. But Congress will not likely pass a law that puts a serious dent in greenhouse gas emissions and begins the necessary shift to clean energy unless we make them do it. Here’s where you come in. National organizations that advocate for meaningful climate change legislation are calling on all of us to write a letter. These groups are asking Americans to write a letter, the old-fashioned type with an envelope and a stamp, to each of their two Senators. Even though email and tweets allow for instant communication, Capitol Hill staffers report that the most effective way to get the attention of one’s elected representatives is through a personal letter delivered by the U.S. Postal Service. For that reason, climate change organizers are calling on citizens to write letters. The goal is 150,000 letters from constituents, demanding that the Senate pass a strong climate change bill this year. This letter writing campaign follows on the heels of a phone-in campaign in which more than 20,000 people called their Senators’ offices over three days, calling for climate and clean energy legislation. The effort was so successful, says Al Gore, that the Capitol Switchboard could not handle the volume throughout the days of calling. 2. Write a letter calling on your Senator to promote and vote for legislation to reduce global warming emissions and to begin the shift to clean energy. Make a copy for your other Senator (changing the name and address, of course). Don’t worry if you don’t consider yourself a great writer, or if you don’t have the latest statistics. Just state your opinion. Give any reasons that matter to you or that you think your Senator might find persuasive. Remember, your Senator is not grading your letter. S/he is getting the message that you are a constituent who cares so much about this issue that you are taking the time to write a personal letter. And Senators know that for every constituent who takes the time to write a personal letter, there are many others of the same opinion, but who do not write. Members of Congress will act when their constituents insist on it. If they receive a lot of mail on this issue, you can be sure they will take notice. Most of them have an eye on the next election. As daily the snow receded, revealing larger and larger patches of bare ground, I watched for the Buddha to appear. Out in the garden facing our house–an area we call the amphitheater–reside two statues, a standing St. Francis and a seated Buddha. Frank and Bud, we sometimes call them (a hot dog and a beer?). Both statues had been completely buried in the overwhelming snowfall we had in early February. But after a few days, the face of St. Francis appeared, peaking out from snow above, below, and behind him. As the days passed, we saw more and more of St. Francis. His entire head appeared, then a shoulder, later his entire torso emerged from the melting snow. Every day, as more of St. Francis was revealed, I looked over to Buddha’s spot beside his bodhi tree (a little curly-branched Harry Lauder Walking Stick). But each time, all I saw was an undisturbed surface of snow. Never a sign of the Buddha, not even the tip of his peaked cap. Why, I wondered, if Francis was shedding his snowy blanket, did Buddha remain completely engulfed in snow? I began to wonder if the snow had knocked over the sturdy sitting figure. That seemed impossible, but I could not figure out why the snow on the Buddha would not budge. Then one day, when Frank was only wading in snow, I noticed a crack toward the top of the mound enclosing the Buddha. Though it was just a little horizontal opening, maybe six inches long, I knew this must be the beginning for Bud. Sure enough. The next day he actually appeared! I saw his head, left shoulder, and part of his torso all exposed, bare of snow. The snow was higher on the Buddha’s right side. It surrounded his right shoulder, but had pulled away a little from his body, forming a space between him and the snow. It was as if the Buddha were wearing a white shawl that had slipped a bit off his shoulder, but still conformed to the shape of his body. I noticed that the edge of Buddha’s ‘shawl’ was lined in black. I wondered why. As I looked around, I could see that many of the patches and piles of remaining snow had hard-looking crusts whose edges were similarly lined in black. Why did black lines of dirt form only along the places where snow formed an edge? I am still wondering. Today trees need people to survive, and people have always needed trees. Diana Wells, author of the new book Lives of the Trees: An Uncommon History, challenges us humans to find any spot that is more than two feet from something related to a tree. Whether it’s kleenex, car tires, an apple, a walnut, or a wooden wall or floor, the ‘products’ of trees are everywhere in our lives. Lives of the Trees is a compendium of what trees have meant to people throughout the history of human culture, and how trees protect the planet. Wells reminds us that trees have been used for food, shelter, and medicine, to make weapons, musical instruments, and ships. People make pilgrimages to feast their eyes on trees’ autumn glory, and we seek comfort in their presence. The book is divided into 100 short chapters, each focused on a different tree species. Wells clearly loves trees, and she hopes that readers will be inspired to get to know the trees growing around them. She laments the fact that many people today pay little attention to to the trees of their area, and know little about them, even their names. Wells believes our lives will be richer if we get to know the trees that support our lives in so many ways. Alder was widely used in the construction of ships, since it withstands water so well. Alder underlies much of the building construction in Venice, helping that watery city to survive. Birch has many uses. Its nuts are edible, its sap can be made into beer, and its bark was used to make canoes and huts. The bark is such a good writing surface and so water-resistant that Thomas Jefferson deemed it the best material for jotting his field notes. Cinchona is the source of the first antimalarial drug–quinine. If the cinchona bark’s antimalarial properties hadn’t been discovered, history might have been quite different. It was only after people knew how to avoid the worst effects of malaria that white Europeans were able to exploit human and natural resources in African countries. Pomegranate is also known as the tree of life. New brides would throw a pomegranate on their doorstep to ensure their marriage would produce many children. Ironically, the hand grenade derives its name from the pomegranate as well, because of its pomegranate-like appearance. This coming week, March 15-19, is National Wildlife Week. Sponsored annually by the National Wildlife Federation (NWF), National Wildlife Week is a time to shake off the winter doldrums, to get outside and enjoy the earth coming to life in the early spring. Even more important, National Wildlife Week is a chance to get kids outside enjoying the nature around them as well. NWF urges families to celebrate National Wildlife Week by having some fun together outdoors. NWF suggests that parents commit to spending at least an hour more outside with the kids than they typically would over the course of a week. And how to spend this time outside? The possibilities are endless. If you’re not sure just what might be some good outdoor activities to enjoy as a family, click on http://www.nwf.org/Get-Outside/Be-Out-There/Events/National-Wildlife-Week.aspx. There, you’ll find descriptions of a wide range of activities and some useful resources. One of the best features of NWF’s campaign to get families outside in the spring is the custom Family Activity Passport. Tailored to your geographic area, the Passport features a week’s worth of local animals and plants to watch for, tips for gardening with children, and games. You can download fun, nature-themed activities for your area, and a list of local outdoor locations that will be fun for your family to visit. Play some old-fashioned games like hide-and-seek, red light-green light, races, and relays. Give birds a treat by making a milk carton bird feeder or by hanging a pine cone slathered in peanut butter and seeds. Take a hike. Find a nearby hiking trail or take a walk around the neighborhood, looking for signs of spring. Visit a park. There, you can play running games, shoot baskets, play charades, and much more. Start preparing a vegetable garden; digging in the dirt is always fun. And if you don’t have a yard, find out if there’s a community garden near you. Create a garden that will attract monarch butterflies. To find out how, click on this National Wildlife Federation link: http://www.nwf.org/~/media/BE79FAF8A6874F8A99F8FD5247D68B5D.ashx. On a winter day not long ago, my wife and I were out walking. As we walked by a couple of acres covered by scrub brush and trees, a flock of small birds of a non-descript brown color alighted from a near-by tree. They went aloft together as by a signal, though we heard none. And they winged their way in a pattern that was as if choreographed to keep constant the distances among them. 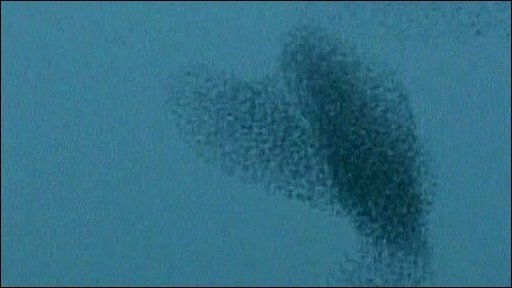 This choreography produced a kind of waving undulation, as the flock seemed to be deciding together just where they were going and which of them fit where in the overall formation. In a split second, the decision to leave the tree near us seemed to be amended by a decision to re-position the flock in two other trees, bare in their winter way, on the far side of the lot. The single flock seamlessly diverged into two components, and each component feathered itself into a splay of individual birds that distributed themselves evenly among the branches of each tree. The flock was now well-settled in its new location, a collective dance of improvised flight that took, altogether, perhaps two seconds. I have always been entranced by the beauty in the patterns of the flights of flocks of birds. Not so much the V’s formed by ducks and geese in their migrations, with their more rigid and military-style maintenance of formation. Rather my greatest delight is in those flocks that seem to make it up as they go along, on the wing, one might say. The way they turn and wheel, and flash one way and all in an instant reconsider as if with one collective mind, and sweep off in another way, the sun playing off the different sides of their bodies as if the birds were one brilliant rooting section in a football crowd shifting the colored cards they hold up to change their show to the admiring crowd. To the viewer, the patterns being displayed are themselves something of great beauty. The patterns we see, however, are manifestations of patterns unseen. One can surmise what must be built into the birds themselves to enable these flocks to perform so magnificent a dance. When those birds took off together, I am willing to bet that it was just a few who decided that it was time to relocate, and that in a tiny fraction of a second, the rest of the flock took the cue and made it look like something the group had been planning for weeks, and rehearsing like a “Drum Line” marching band. There’s some high-performance response pattern, I assume, wired into their brains, which enables them to make such instantaneous collective decisions. Over the millions of years of millions of generations creating this species of birds, the capacity for precision flying that would put the Blue Angels to shame has doubtless been an important component of these birds’ adaptive strategy. Evolution has created in these birds –in the wiring of the system in the birds that embraces the steps from perception to alteration of their course in flight– a set of deep patterns, perhaps an algorithm or set of rules, that translate into beauty, the poetry in motion they reveal as flocks in flight. Good news about our oceans. Recent research shows that Marine Protected Areas (MPAs)–spots in oceans around the world that have been set aside by governments for conservation–are effective at increasing the amount of living coral on the ocean floor. And why does increasing the amount of living coral matter? Coral reefs are far more than colorful treats for the eye. They are nursery, home, and ‘farm’ to one-third of all marine fish species. Coral reefs are often compared to rainforests for the vast biodiversity they support, and to old growth forests for the longevity of their ecological communities. Yet coral is under threat. Forty percent of the world’s coral reefs are in critical condition or are degraded beyond recovery. Scientists have long known that the regulation of fishing and other potentially harmful activities in MPAs is effective in restoring fish populations within MPA boundaries. Encouraged by that good news, two marine scientists at the University of North Carolina-Chapel Hill wondered if the thriving fish populations in MPAs might indirectly be improving coral health by restoring reef-based food webs. So the two researchers, Dr. Elizabeth Selig and Dr. John Bruno, conducted the first comprehensive global study to gauge the impact of MPAs on coral. The two looked at more than 8,000 live coral cover surveys of more than 450 coral reefs in 83 countries. The surveys, all conducted between 1969 and 2006, compared the percentage of live coral cover in 310 MPAs to live coral cover in nearby unprotected areas. The percentage of ocean floor covered by living coral is a key measure of the health of coral ecosystems. The scientists found that while the living coral just outside the MPAs declined over time, the coral within MPA boundaries remained constant or increased over time. In some MPAs, coral continues its decline for some years after the MPA designation is made, and then begins to grow. In an Indo-Pacific MPA, for example, coral cover declined for five years after the area was designated a Marine Protected Area. And then the percentage of live coral cover began to increase, reaching a growth rate of 2% per year after two decades. Selig’s and Bruno’s research proves that ocean conservation efforts make a difference in restoring our coral reefs. Around the world, coral reefs are threatened by overfishing and harmful fishing methods, sediment and nutrient runoff pollution from adjacent land, invasive species, and the the growing acidification of oceans as a result of global warming. Much of the information for this article came from Flora Lichtman and Joe Palka, Science Friday, National Public Radio. You are currently browsing the Earth Connection blog archives for March, 2010.